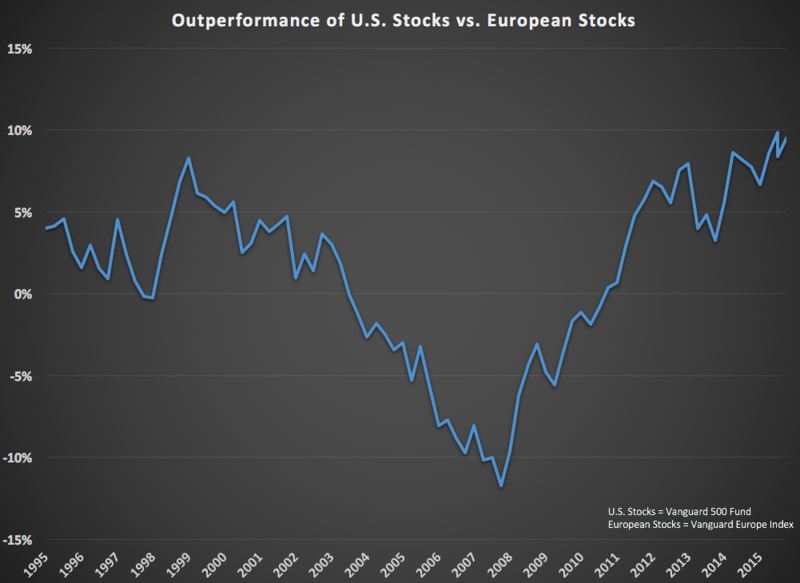 Are European Stocks Cheap or is the U.S. Expensive? One of the most counterintuitive aspects of investing is the fact that you almost need to have bad news for things to get cheap enough to create a good long-term value. Markets or securities don’t become undervalued all on their own. There’s usually a catalyst involved in the form of poor fundamentals, bad news, missed expectations or a combination of things. Europe seems to fit the bill here in terms of bad news. There are negative interest rates in many European countries. Economic growth is slow-to-non-existent. The demographic profile isn’t pretty. And the European Union looks to be something of a failed experiment as a fiscal union with no easy way out. You can see that the current relative outperformance by U.S. stocks is as high as it’s ever been. For comparison purposes, in late 2007/early 2008, there was a five year period where European stocks were outperforming by over 11% per year, so these points in the cycle can go the other way too. One positive from this huge divergence is the fact that markets around the globe aren’t quite as intertwined as many in the world of finance or economics would have you believe. This is a benefit to diversified investors. There’s an old saying that diversification works whether you want it to or not. There are two ways investors tend to look at these types of numbers — either Europe is a bargain or the U.S. is overpriced. It’s probably some combination of the two, but mean reversion doesn’t operate on a set schedule. Fundamentals don’t matter until they do. It could certainly take some time for this relationship to reverse if the bad news continues across the pond. But it’s also worth noting that the news doesn’t necessarily have to get better for European stocks to close the gap. It just has to get less-bad. European equities trade at a huge valuation discount to the U.S.
European equities have underperformed at a historical rate over the past five years. European equities currently sport a 1.2% advantage in terms of dividend yields. This information won’t matter until it matters as fundamentals in the stock market require patience and don’t work on a set schedule. Great chart, I really like the compares – simple and meaningful. This type of article is like seeing a $100 bill in the street. Do you dodge traffic & risk injury to pick it up, or leave it be – knowing that your personal finances are just fine, thank you very much?! I’m the guy with the stick on the sidewalk, hoping air turbulence will waft that bill within striking distance. I have a nicely performing portfolio that’s doing just fine, with a considered asset allocation strategy. If and when Europe takes off, it will help my returns, and that’s all I really need… but it is oh so tempting to slowly overweight some segments like EM and European stocks over time. Yup, for most people it’s more about rebalancing into this type of performance than it is about making a huge call and overweighting things. The european economy does not have the same potential as the US, in my humble opinion, in the long run, due to higher taxes and a defunct eurozone. In the short run Europe can outperform but I am not sure in the long run. This is a sensible thought. Ben? Excellent information and article—–thank you! Any insights or thoughts as to how “total international” equity compares to “U.S. equities” over a similar time frame(? )—-for those of us who (just) buy a total international index fund for our foreign exposure—-as compared to selecting discrete foreign countries or regions? Something to consider: A large portion of the recent underperformance of international stocks is due to dollar strength. When the currency is hedged out (HEDJ, DXJ, etc) the underperformance is actually pretty muted. True, HEDJ up 6% or so in the past 5 yrs so currencies are a little under half of the underperformance. HEDJ might not be the tool we hoped for as a way to remove the currency component from the US/Euro comparisons. Hedged Europe ETF performance not so hot HEDJ while up 30% you’d be up 70% if you just bought Europe index and shorted euro currency. HEDJ while up 30% you’d be up 70% if you just bought Europe index and shorted euro currency. I’m @tr8v8 on twitter, just got copy of “The Institutional ETF Toolbox” book on your advice. Loving it! The industrial or sector composition matters in these regional comparisons. The US equity market has more growth oriented companies while Europe has more traditional value type of companies. The US almost always looks more expensive than Europe due to the higher growth rates and company profitability. Another very important aspect to recognize is that companies in Europe nor the US are really just domestic companies. The largest companies in the US and Europe are really multi-nationals domiciled in a certain location due to a historical accident, a merger, or heaven forbid a tax inversion strategy. True, you have to take into account the industry make-up in all of this. Not always an apples-to-apples comparison making valuation comps across countries. 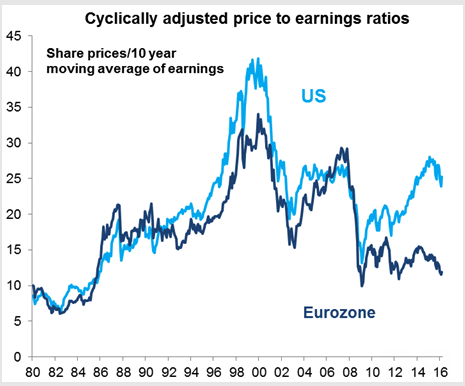 My thinking is that, in general, US equities are cheap, and European equities are cheaper. My question is where and how to buy europe stocks… i know there are lot of ADR’s but it seems to me that is better to buy directly european stocks from their original stock markets. For example when i try to research the dividend history of a europe company, i don’t find the info in the ADR website (most of them in OTC markets)… so is more difficult. Another issue is the lack of dividend growth stocks outside the US…. what is your opinion ? why almost all the great dividend growth stocks are in the US and only a few outside it ? Thanks and keep continue writing. It’s a spread of confidence and most easily played using futures. For example buy the S&P 500 through the E-mini futures at The Chicago Mercantile Exchange (CME) and sell the DAX through FDAX futures on Eurex. The investing marketplace simply has more confidence in growth here than they do in Europe. Interest rate expectations, as shown through changes in deferred interest rate futures contracts, are indicative of that. I have wrestled with this a lot. I don’t know about Europe as a whole, but I know that the very long-term total return (past 30 yrs) of the FTSE100 is around 9% pa, whereas DOW is around 11%. And of course 2 percentage-points over 30 years makes for a very big difference, compounded year-in-year-out. Energy costs of course have fallen very significantly in the US in the past 8 years (the period of this disconnect) – much more so than in Europe – because of shale etc. – and this makes a big difference especially to heavy industrial users. I believe Mr Market knows all this, and as such is willing to pay a premium accordingly. I live in Germany and agree in part with your analysis but am of the opinion that there are certain other factors that are current, that need to be taken into account. All my percentages are approximate. As of April 13, 2016 none of the above have a confirmed trend reversal on the monthly charts. Could be a dead cat bounce but if history is any indication of the future then doubt it unless we have a bond market collapse. Dax 9950- bottoming out, range bound between 9322 and 11441, a break below 9322 will test the Feb low of 8699 and a break below 8699 will test 2008 high of 8147. Above 10481, resistance at 11441 and then 12400. EurUSD- range bound but the squeezing of the boilinger bands signify a move. If it can close abov 1.15 then EURUSD will shoot towards 1.2 otherwise expect it to fall towards its lower range 1.4. OPENING of Iran will be a huge boost to the European economy. The strengthening of the USD which needs to happen due to negative interest rates, more QE taking place in Europe. European companies will benefit with the ECB buying their bonds this is unprecedented and will allow companies to invest in growth and more employment. From Dec 2007 to March 2009 we had a grand financial crisis. A bubble burst, a finance crisis occurred. It was a bloodbath! What happened after that was an amazing QE recovery. Free money being printed it drove economies for over 6 years and in year 7 we are experiencing hiccups, war, Oil and anemic growth. BUT since 2009 the Dax has outperformed the DJIA. commenced. The Dax from its low in March to its peak in April 2015 rose an impressive 245%. The DJIA from its low in March to its peak in May 2015 rose 177%. Brent Crude rose from its low of 33.73 in DECEMBER 2008 rose an impressive 292.89% until April 2011. The USD rose from 1.24729 in MARCH 2009 to 1.49391 until April 2011. In 2011 we had a correction. From the lows of that correction in Sept 2011 to April 2015 the DAX rose 153.3%. The DJIA rose 78.05% from Oct 2011until May 2015. BRENT CRUDE fell 78% from Feb 2012 until January 2016. The EURUSD fell 29.56% from May 2011until March 2015. In Jan 2015 when European QE was started the DAX soared 22.41% in 3 months until April 2015. The DJIA was little influenced a 5.86% rise until May 2015 as the US was expecting its first rate hikes. Crude rose 45.4% to 69.31 USD in May 2015. The EURUSD rose 11.3% to 1.1676 from March 2015 to August 2015 contrary to the concept of the European QE. USD started falling from August 2015 to a low of 1.0555 in November 2015. The DAX fell a whopping 30% from April 2015 to Feb 2016 and lastly the DJIA fell 16% from May 2015 to January 2016. In December 2015 Janet Yellen introduced the first rate hike. The markets lost it in January 2016. In February the markets started to price in the anticipated European all out Bazooka from Mario Draghi and in March he introduced it. The markets look fine a correction just took place so there is only one way and that is up. A recession has not yet occurred.